Facebook’s Graph Search is an amazing tool that allow users to quickly and easily find very specific things within Facebook however, users were only limited to four type of things they could search for – people, photos, places and interests. It looks like Facebook wants to take things a step further by allowing users to search for status updates and posts shared by their friends. 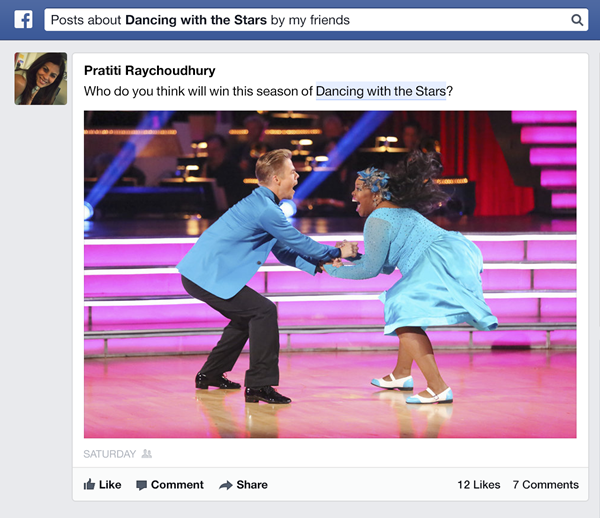 Currently being rolled out slowly to those who already has Graph Search on their Facebook, you will soon be able to search for things you are interest in and find out what your friends are saying about it like “Posts about Dancing with the Stars by my friends”. As with the rest of the Graph Search capabilities, you will be able to refine the search further such as setting a time frame. Users will also be able to use the new Graph Search to find for things they’ve shared before like “posts I commented on” or “my posts from last year’. Worried about your security? You should be, according to Facebook, the things you see are the things that have been share with you so no, you will not be able to dig out stuffs about people that they aren’t willing to share with you. Afraid of your stalker’s life made easier? Knowing how frequently Facebook likes to tweak things, you should always review your privacy settings in Facebook every now and then.